Hate to break it to you, but you can’t do it all. It’s exhausting. And as your business grows, it’s just not sustainable. (Trust me on this one). Sure, there’s a time and a place to DIY in your business, but at some point you need to trust the experts and lean on others to help you so that you can stop feeling burned out and see progress in your business. I want to make sure I’m covering all of the basics. I don’t know how to draft my contract. I don’t know what words to use or how to phrase things. I’m worried that I might have a missing term that’s going to create a big problem for me down the road. It’s totally understandable why you might feel this way. I’m going to make a wild guess – you probably haven’t gone to law school and you probably don’t have a legal background and so therefore, you don’t know how to draft contracts. That’s totally okay because your job is not to draft contracts in your business, okay? Your job is to understand contracts. you’re probably still going to get it wrong. Just like you’re really good at whatever it is that you do, there are other people out there who are really good at what they’re good at. Whether it’s drafting contracts or the law, accounting, or graphic design, right — why waste the time trying to figure it out when there are people and services out there who could do it for you a whole lot faster, a whole lot cheaper, and a whole lot better . 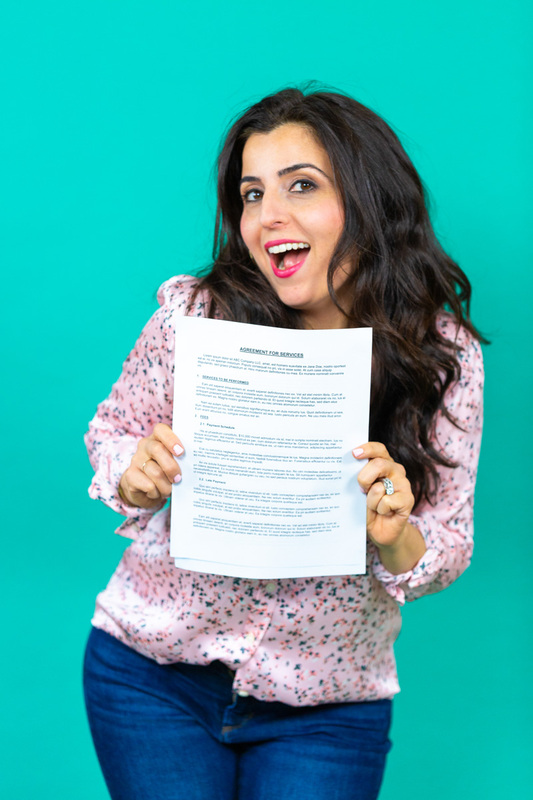 If getting contracts squared away in your business feels like a struggle for you and even when you do get around to it, you don’t feel confident in your contracts, then grab one of our templates to get solid contracts drafted for your business.